If you’re too busy in the office and do not have the time to keep your property clean, you must book a Domestic Cleaning London service. Professional cleaning services are particularly useful after you throw a party at your home, or after the holidays. Many people also employ such companies regularly for one off cleaning services. Actually, the increase in the number of people looking for specialist cleaners prompted the increase of agencies offering cleaning services. But you can’t simply pick a firm and expect to get a premium quality service. Here are a few things to keep in mind when employing a qualified cleaning agency. The most important thing to remember is that these agencies should manage to fulfill your needs. Your first order of business is to assess what type of cleaning services you need. For example, ask yourself whether you require normal cleaning services like dusting and vacuuming, or you need more advanced services like window cleaning. Expert cleaning companies have the required equipment to meet your needs. On top of that they follow a standard working procedure whenever they start cleaning your home, however you may give them a set of orders and they should manage to follow your customized arrangement. One more thing you should ensure is whether or not the agency has a valid insurance cover. This eliminates the possibility of you having to pay for losses and damages in your house if something happens during the service. You should also determine the procedures used by the company when employing cleaners. Their staff have to be legal residents and have a clean criminal record. 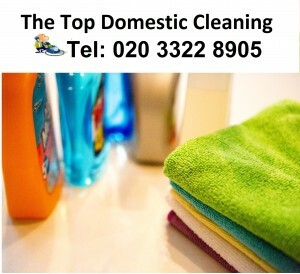 If you require more facts about our Domestic Cleaning London, don’t hesitate to give us a call on 020 3322 8905.